Deutsche Welle (DW) has put intercultural dialogue at the forefront in 2012 by expanding its work with partners in the Arab world. DW is producing “Hiwar El Khamies” with Raya FM in Palestine along with “Rabia Al-Shabab” with Voice of Lebanon. Both coproductions show DW’s focus on the future of the Arab world and will be produced weekly. Hiwar El Khamies officially began on February 1 and will be aired on Thurs-days at 3:30 pm local time in Palestine. “Similar to our TV talk shows in the Arab world, we want to use radio as a medium to create a dialogue between Europe and the Middle East,” said Rainer Sollich, Head of the Arabic Radio Programming at DW. The talk show will be hosted by radio personalities from Raya FM and DW, and will welcome expert guests to discuss a range of different topics. Listen-ers will have the opportunity to join the conversation and continue the debate online on DW’s Arabic Facebook page. Besides Raya FM with its nationwide reach in Palestine, the coproduced program will be aired by three other DW partners: Radio Albald in Jenin, Radio Alwan in Gaza and Radio Marah in Hebron to maximize the number of lis-teners in the region. Germany's Foreign Minister Guido Westerwelle joins the discussion on DW-TV ARABIA. 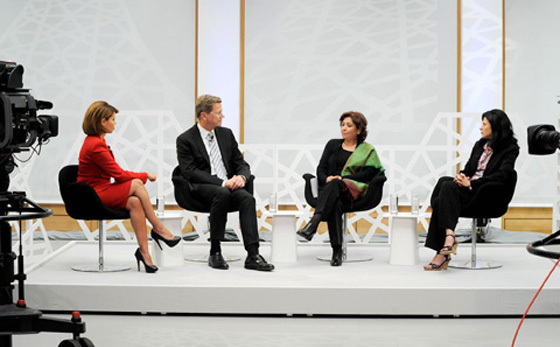 DW relaunched its channel for the Arab world yesterday, with a new focus on dialogue and programming in Arabic. Audiences from Morocco to Oman can tune in to DW-TV ARABIA for a six-hour block in Arabic – always in primetime. English-language programming will complete the channel’s 24-hour line-up. Up until now, the schedule alternated hourly between Arabic, or German with Arabic subtitles, and English. This is just a continuation of DW’s strategy of introducing new, regionalized productions to help improve the connection to its viewers around the world. Along with new Arabic versions of DW’s shows GLOBAL 3000 and Arts.21, the new DW-TV ARABIA also features four new talk shows, each focusing on different facets of society. Shababtalk is a co-production with Al Hayah TV, the leading station in Egypt. Young representatives from the democratic movement in Egypt join in on discussions with their German counterparts from youth organizations, political parties and other associations. On the Pulse brings Arab and German experts together to discuss issues related to democratization, politics, economics, the role of the government, justice and religion. Talking to the Press is a roundtable discussion with German and European editors-in-chief and their Arab colleagues. Guest of the Week offers the chance for public figures to come into the studio to discuss current developments in the Arab World. DW also launched its new YouTube channel for Arabic yesterday, making its Arabic content available online to viewers around the world.